Should Afghan Government Wait for Taliban Response? FILE - Armed Taliban fighters are seen at an undisclosed location in Nangarhar province, Afghanistan, Dec.13, 2010. As the Taliban's fight against Afghan forces continues, and after the group's threat to launch more attacks, some experts offer divided opinions on whether Kabul should hold to its peace offer and wait for a response from the insurgent group. In February, Afghanistan President Ashraf Ghani offered unconditional peace talks to the Taliban, in addition to a chance to recognize the group as a legitimate political party. After a fierce firefight in western and central Afghanistan, the Taliban warned civilians to stay away from government buildings in the capital city of Kabul as the group was planning to carry out attacks against these targets. "The attacks against [military, intelligence and other important institutions] are part of the Al-Khandaq spring offensive," the Taliban statement issued Monday read. The statement comes months after the group claimed responsibility for a car bombing in Kabul on Jan. 28 that killed more than 100 people. "There is no doubt that the Taliban is not going to talk with the Afghanistan government unless they reach an agreement with Americans first," Waheed Muzhda, a former member of the Taliban, told VOA. "They [Taliban] want to say that the Afghan government is inconsequential and a puppet and its offer is not worth a response," he added. Smoke rises from the site of the second deadly suicide attack on police stations in one day, May 9, 2018, in Kabul, Afghanistan. The Taliban claimed responsibility for the series of attacks. U.S.-based Afghanistan expert Mohammad Jawad Rahimi said expecting a positive response from the Taliban is like building a castle in the sky. "The Afghan government, in cooperation with its international allies, should conduct serious military operations against the Taliban across the country as it would not receive any positive response to its peace offer," Rahimi told VOA. "Recent terrorist attacks show that the Taliban is a proxy of Iran and Pakistan who kill civilians and Afghan and international security forces on a daily basis. The Afghan government should use its diplomatic channels to negotiate with Iran and Pakistan to stop the violence, as these two countries are producing and supporting terrorism in Afghanistan," he said. Both countries deny charges that they are providing support to the insurgent groups in Afghanistan. Former Afghan army general Amrullah Aman said the Taliban is divided into many fractions and some of them are waging war against the Afghan government. "Since [the] Taliban has launched the Omari and Al-khandaq offensives, it shows that the insurgents are on the offensive side and the Afghan government is playing a defensive role. The Afghan government should crack down on those Taliban that resort to violence," Aman told VOA. "The green light from some of the Taliban factions is the reason why the Afghan government still insists on its peace offer." U.S. President Donald Trump's administration reiterated its support for an Afghan-led and Afghan-owned peace process. "I think what we want is the Afghan government to take the lead in this," National Security Adviser John Bolton told VOA. 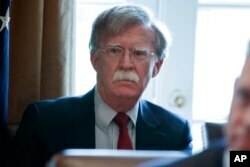 "And we will see there if the Taliban and all the various other factions that are involved in threatening the Afghan government are really interested in negotiations that could lead the peace," Bolton said. The re-emphasis from the Trump administration comes at a time when the Taliban seeks to have direct talks with the U.S., which the U.S. rejects. "We and the international community want to see a peaceful end to this conflict, but until that time, we will stay with you if necessary to fight alongside you until we achieve that peace," U.S.-led NATO commander Gen. John Nicholson said last week. "The peace offer the Afghan government has made is what the Afghan nation seeks. We have voiced for unconditional peace — the doors are open to those groups who are Afghans and want to make peace.The Afghan government will fight warmongers," Dawa Khan Menapal, an Afghan presidential spokesperson, told VOA. The Afghanistan High Peace Council (HPC), the body tasked with talking to the insurgents, also claims there is still a possibility of peace talks with the Taliban. "According to the reports we obtained from different sources, including media reports, the Taliban, or the armed opposition leaders, have started discussing how to engage in discussions with the Afghan government," Sayed Ehsan Taheri, HPC spokesperson, told VOA. "The Taliban insurgents increased their attacks, and the group has carried out around 1,000 attacks after the announcement of the Al-Khandaq spring offensive. 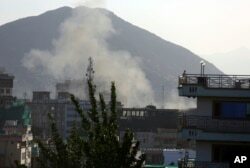 In response to these attacks, we are conducting up to 20 military operations on a daily basis," Afghanistan's ministry of defense spokesperson Mohammad Radmanish told VOA. Atturahman Saleem, deputy of the Afghan High Peace Council, said that war cannot bring forth peace. When asked whether the council would wait for a Taliban response, Saleem said, "Absolutely. Necessary pressures, military, political and religious, should be built on the Taliban. Sooner or later it will work, and the Taliban would have no other option but to join the peace process."